Essential Craft Room Ideas That Will Inspire Your Passion to Create! According to the Chicago Tribune, the popularity of arts and crafts projects in Chicagoland homes is on the rise! The DIY movement took off during the recession and, as the economy recovered, people just continued with their crafting habits says Dana Macke, lifestyles and leisure analyst at market research firm Mintel. With the children home from school and the holidays quickly approaching, many more households will find themselves engaged in craft projects with the kids. Furthermore, large numbers of adults have turned to arts and crafts as a way to relax and fullfill their own inner creativity. Being able to present a personalized gift to loved ones is always a treasure that cannot be matched by factory made purchases. One thing is certain. Whether you're into painting, sculpting, sewing, scrapbooking, sketching, building birdhouses, models, or just need a space to wrap presents, a designated craft area will enhance your ability to follow your passion. Face it, arts and crafts — or other hobbies of the sort — can be messy. They often require many specialty tools and supplies that all need to be stored in an organized manner until the project is complete — which can be weeks or even months in some cases. No matter if you need the arts and crafts/hobby space all year long, or you are just a holiday crafter looking to make your own personalized gifts, your best bet is to have a separate, organized area where in-progress projects can be left out until they're finished without getting in the way of other family members or inconveniencing the running of the rest of the home. Even if your available space is limited, however, you can still have a separate craft area for your hobby by following a few simple pointers. Your designated craft area can be located either in its own separate room or in an out-of-the-way corner of another room. If the craft area shares space with another room, it is a good idea to partition the area off with an attractive bookcase or other furniture that can double as storage for your hobby. The optimal craft area for you will depend on the needs of your family and your own personal space requirements in combination with the size and layout of your home. The key to having an organized art or craft area in your home is setting up a good storage system to house all the materials and tools of the trade in a safe, attractive yet convenient manner. 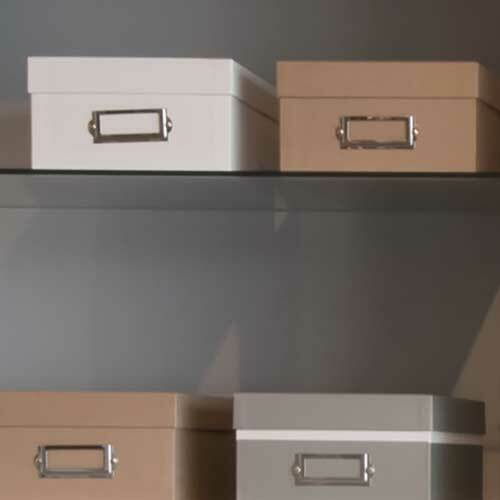 There are many types of storage containers available to keep everything organized. Storage solutions run the gamut from racks, jars, baskets and boxes that that keep the clutter contained and under control, to custom built-in organizers that are designed specifically for your needs and home. Although different storage containers abound on the marketplace, there are a few essential rules when deciding how to organize a craft room. Table or Work Surface: A sturdy table or other work surface for your hobby is an absolute necessity. Even if you paint and use an easle, it is also a good idea to include some sort of horizontal flat surface for laying out sketches in your space. Unless you never use it for eating, this surface should not be your dining room table. The work table is best if it can remain undisturbed between sessions. For this same reason, it is best not to spread everything out on the floor. 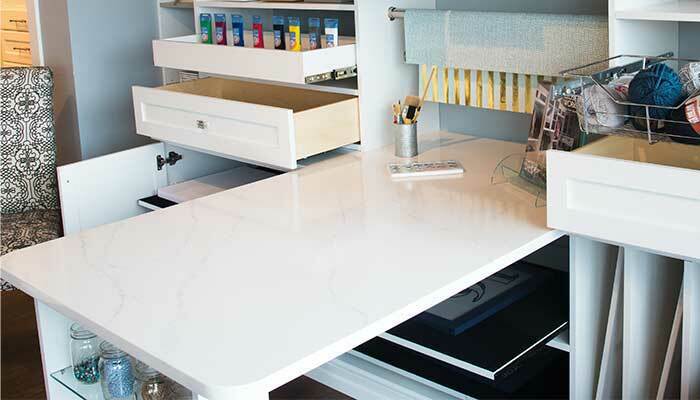 The best table/desk tops are a solid, smooth surface, free of deep grooves between boards or texture that might come through and compromise your drawings, or cause tiny pieces of crafts to be lost. (Notice the use of closet rods above and at the end of the table for convenient wrapping paper storage). Flat Storage: Some sort of flat storage is recommended for your craft/hobby space. Flat storage will allow you to keep materials from warping or bending. It is essential for sheets of paper, which curl easily if not kept flat. If you work on multiple projects at a time, flat storage will offer some protection for your in-progress projects until they are finished. 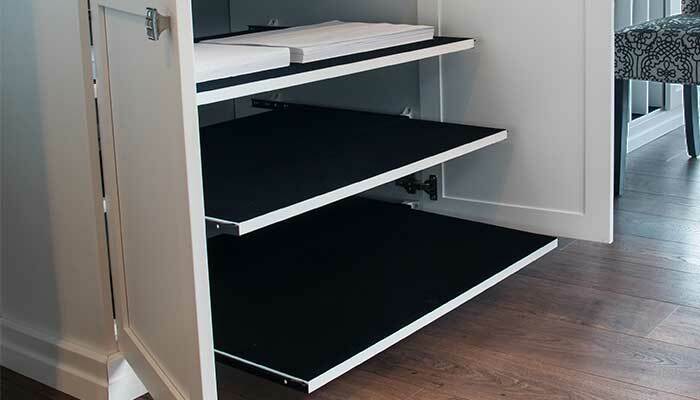 Included in flat storage are pull-out shelves, large drawers, flat files or deep shelves. Vertical Storage: Vertical storage is needed if you paint on canvases, or for some types of collage and sculpture. Artists have long known this type of storage as "drying racks." It is the best way to store canvases (meaning paintings). Vertical storage allows an artist to take one canvas off the easel, safely putting it aside while working on another. It main seem, at first glance, that this type of storage is a specialty solution that might be difficult to find without going custom. However, any vertical tray organizer designed for the pantry will work wonders with artist canvases as well. 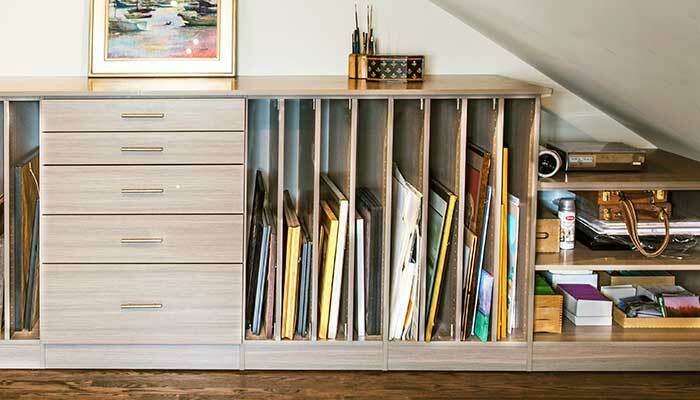 Drawers: Drawers are not only good for storing paper as mentioned above, but they can corral a host of small items. Drawer organizers can further subdivide the space to neatly keep all items in their designated places. Wall Storage: Incorporating wall storage goes a long way towards ensuring that you are using your space to its maximum potential and not wasting any space. It also keeps items organized while simultaneously visible at all times. Examples of wall storage could include a wall shelving system, but it usually refers to hooks, grids and wall tracks used to organize a garage or tool bench. Tool bench organization systems work especially well for craft storage, and many of these types of organization systems include accessories intended specifically for craft storage. Cabinets: Some crafting tools and materials just look messy, no matter how carefully you organize and store them. This is when you need to think about incorporating a cabinet in your overall storage setup. Closed doors keep everything looking neat — a definite bonus if the craft area is visible to other areas of the home. It is also possible to install a lock on cabinet doors. The same easy to install locks used for jewelry drawers can also be used for craft cabinets. Locked cabinets are a good way to keep small prying fingers out of danger or in-progress gifts out of sight until the big day. Shelves: Shelves of different depths are part of almost every type of storage system. They can organize a lot of craft materials, especially when used in conjuction with different types of containers like those listed below. A type of shelf rarely considered for craft storage, but extremely useful for organizing the numerous small tools and supplies used by home crafters, are pull-out pantry shelves. Available with either straight or scalloped fronts, pull-out pantry shelves are a hybrid between a drawer and a shelf. Items are visible, as on a regular shelf, but the pull-out pantry shelf is installed on drawer slides so that it pulls out and has a 2" - 3" inch lip to keep items from falling off the shelf. Just as in the organized pantry, these shelves keep small items easily accessible so that nothing gets lost in the back. Boxes, Jars and Baskets: Recycle and reuse! Attractive containers are available from many stores, however, you probably already have many great storage containers just waiting to be adapted for your craft supply use. 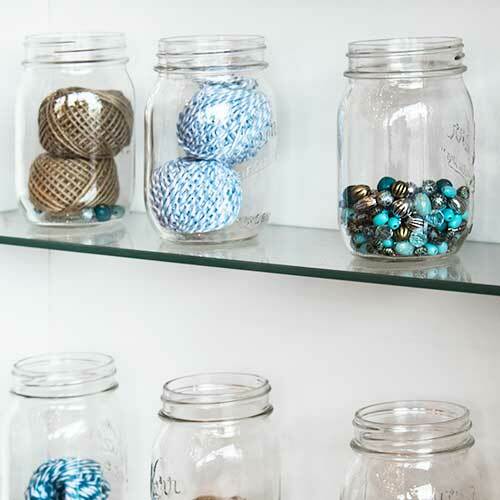 Mason and pickle jars are the perfect size to display many craft items like buttons or other bits 'n bobs. Baskets are a traditional storage solution for gathering many small items of the same type for storage on shelves or in cabinets and drawers. Shoe boxes have long been used as an organization solution. The old fashioned cardboard type look better than clear plastic shoe organizers and are frequently given for free when you buy shoes. When painted or covered in coordinating decorative paper or cloth, they make a very attractive storage solution. Add a file label holder to mark the contents. You will be happier with these boxes than with clear plastic containers, and they can be customized to match your decor. Paper Storage: All craft/hobby/art rooms will require some type of paper storage. The drawers and horizontal storage listed above will serve your flat sheets of paper well, keeping it organized and preventing curling. Large sketch books can be kept in the vertical storage like canvases. Rolls of paper require a different solution. Round or oval closet rods work really well for rolls of wrapping paper. Cut the rod down if necessary with a hack saw or order it to size. Standard wrapping paper rolls vary in length from 30" - 48". Measure the width of the space where you intend to install the rod. It will need to be mounted between two vertical supports (typically a shelving system). Hang the paper on the rod by inserting the hollow roll into the closet rods, just as you would with a roll of toilet paper. This also works well for rolls of ribbon. Another good solution for organizing rolls of paper is a pull-out closet hamper. They come in cloth versions that hang on a pull-out rack, wire basket hampers mounted on slides like drawers, and tilt out hamper versions. A tilt hamper from the closet makes a great organizer for rolls of paper in a craft room. A closet rod can be mounted between two shelving supports or above a desk to hang a roll of paper and ribbons. Horizontal storage can be used for both sheets and roll paper if it is deep enough. Vertical storage organizes gift bags. Trash Storage: Never forget to include someplace to put all the garbage. Rather than a trash container left out in the open, consider a pull-out waste basket like those used for kitchens. This is especially important if the craft area is visible to other areas of the home. This example includes a hidden recycling bin as well. 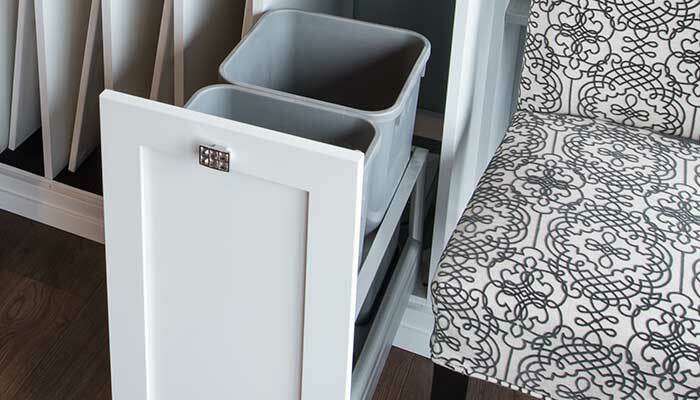 Just like the closet hampers mentioned above, pull-out trash bins also work well for storing rolls of paper. Example of an art and hobby space room that is chock-full of craft room ideas. Custom organization solutions like pull-out pantry shelves used to store acrylic paints, combined with off-the-shelf containers like mason jars, buckets and boxes, demonstrate great ideas on how to organize a craft room. 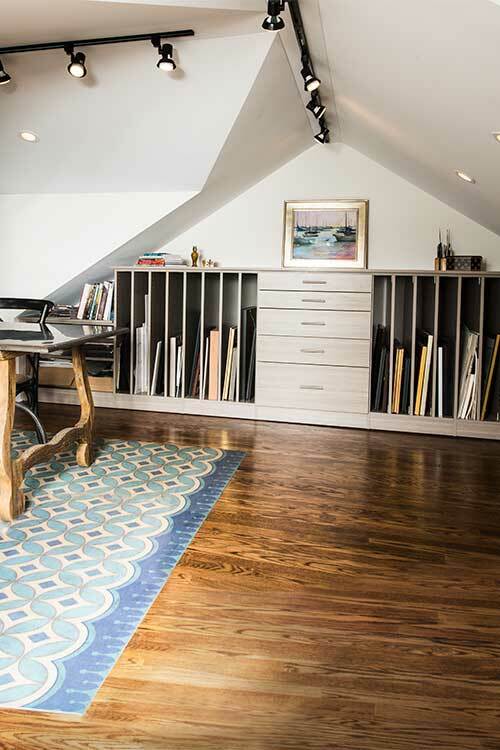 Example of a professional artist's home studio featuring vertical storage, shelves and a bank of drawers to house all the canvases, sketch pads and other painting gear. The storage unit was custom designed to fit under the sloped walls and slanted ceiling of an attic room located directly under one of the roof's main gables. 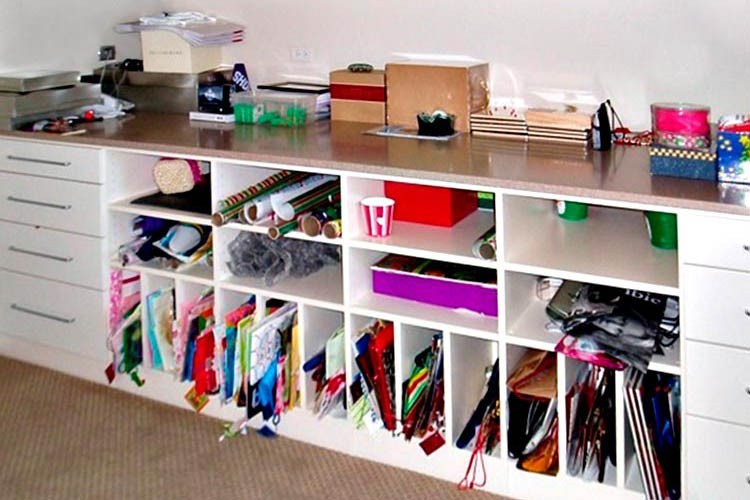 Example of a craft room designed with two desks to accommodate simultaneous use by both parents and children. 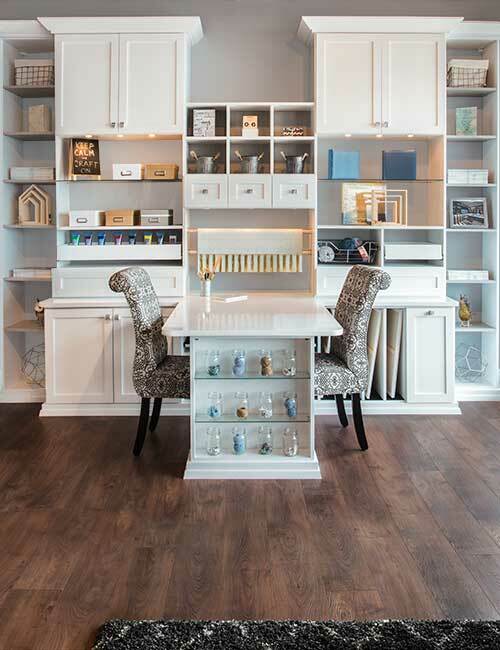 Nestled in what was previously a walk-in closet, this arts/crafts/scrapbooking center features many great craft room ideas to keep all your supplies organized. The space is also great as a homework area for younger children. A system of vertical organizers and deep shelves is a great way to organize rolled wrapping paper and gift bags in your craft room. It can also be used for art supplies, scarpbooks and many other hobbies. 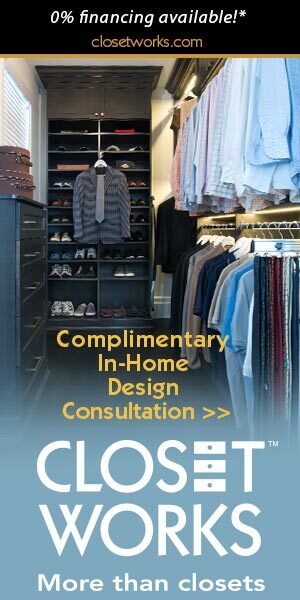 Closet Works is Chicagolands' largest and most experienced provider of custom storage solutions. Since 1987, we have been helping homeowners by creating custom craft rooms, art studios, closets, pantries, office/guest rooms, wall units and more that help create a better, less stressful lifestyle. 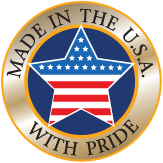 All of our organization systems are made locally at our factory in Elmhurst IL. USA. Great ideas to "Organize Your Life" and examples of our arts and crafts rooms or other custom organization systems can be found throughout our website. For more information on Closet Works call toll-free at 800-4-CLOSET (800-425-6738).